UFC’s relationship with the Asian market is an interesting one. Although they get a huge chunk of money from Asia through broadcasting deals, the number of Asian fighters that went on to make it big in the UFC is pretty low. The exact reason for this lack of Asian impact in the UFC is something that is worth debating about. However, we will not be exploring the same today. Instead, we will be looking into the Asian fighters that actually made a mark in the promotion. As mentioned, the number of Asian fighters that made an impact is not great, but we have enough to filter out five names. 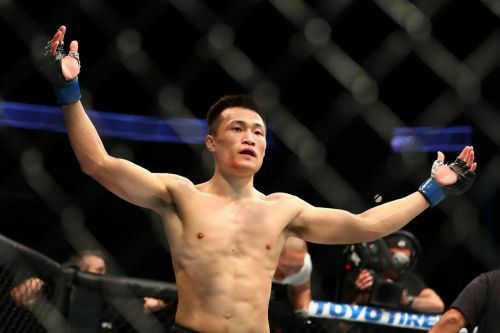 So without further ado, here are five of the best Asian MMA fighters that stepped into the octagon. The Korean Zombie is one of the most popular Asian fighters on the current UFC roster. He started his career back in 2007 and fought in promotions like Pancrase, Korea FC, Deep and WEC before stepping into the Octagon. He was an immediate hit in the UFC and defeated Leonard Garcia and Mark Hominick in his first two fights in the promotion. Both fights ended in stoppage victories for Jung. His third fight in the UFC came against Dustin Poirier and it is still considered to be a classic. It won many Fights of the Year awards and also helped Jung to get a shot at Jose Aldo for the Featherweight title. Although Jung failed to capture the belt, his performance was a memorable one. He fought two more times in the UFC after his defeat to Aldo and won two fight night bonuses as well. He currently holds a professional record of 14-5 to his name and from the looks of it, we can expect a lot more from the Korean Zombie in the coming years.